Lewis Hamilton finally got the start to a race he’s been looking for at the last few events, getting away cleanly from pole position and leading the way to victory in reasonable comfort. 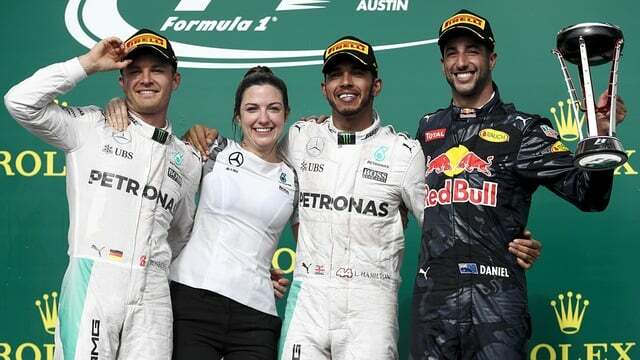 Nico Rosberg, meanwhile, had more trouble off the line, losing out to Daniel Ricciardo who muscled his Red Bull into second place. However, everything came apart for the Red Bull crew, when Max Verstappen came in to the pit lane when the crew weren’t ready, and then retired from the race with a gearbox issue. He stopped out on track and brought out the virtual safety car, which effectively handed Rosberg and Hamilton free pitstops and cost Ricciardo his second place. He ended up taking home a third place trophy. Meanwhile, other retirements included Nico Hülkenberg who suffered a collision with Bottas on the first lap, Esteban Gutiérrez who had brake failure at his team’s home race, and Kimi Räikkönen who was let go from his pit box with a wheel not attached correctly.